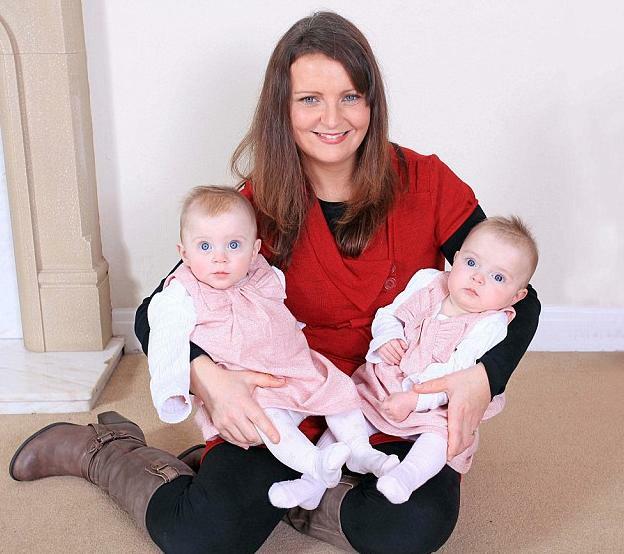 Born five weeks premature, twins Amelie and Ava only just made it into this world after being resuscitated with oxygen. But they’re not the only ones who are lucky to be alive. Their mother Angela Cottam almost died after a suspected fingernail or hair from one of them passed into her bloodstream during their birth. The rare condition – which affects only one in 80,000 births – caused 32-year-old Mrs Cottam to suffer severe internal bleeding and her lungs collapsed. The primary school teacher lost seven pints of blood, needed 22 transfusions and spent 12 hours in a coma, when her family was told she might not pull through. Mrs Cottam, who is married to Peter, 33, said: ‘I feel so lucky to be here and really blessed that both the girls are with us because it could have been so different. ‘There are moments when I’ve been on my own and I’ve had a little cry and thought “What if?” But I try not to dwell on that and just thank my lucky stars the doctors and midwives on duty that day recognised what was happening. Mrs Cottam, who also has a four-year-old daughter Olivia with her husband, was admitted to the Countess of Chester Hospital suffering from pre-eclampsia – the potentially fatal condition which causes high blood pressure and swelling in pregnancy. Doctors decided the babies, now aged eight months, needed to be born before the condition worsened, so Mrs Cottam was induced. The labour was progressing normally and Mrs Cottam asked for an epidural. But shortly afterwards a midwife became concerned that Mrs Cottam was coughing and struggling for breath. Medics realised Mrs Cottam’s lungs were collapsing because she was suffering a rare complication, known as an amniotic fluid embolism, where fluid from the sac surrounding the babies leaks into the mother’s bloodstream through blood vessels in the womb. Cells – such as a fingernail or hair – from the unborn children, that were in the fluid, travelled to her lungs, prompting a severe allergic reaction. Doctors immediately began giving Mrs Cottam oxygen and rushed her to theatre for a caesarean section to try to save the babies. Amelie was the first to be born, weighing 4lb 2oz, followed by Ava, weighing 4lb 10oz a minute later. After successfully delivering the girls, however, medics realised Mrs Cottam was haemorrhaging because her blood had lost the ability to clot. She was given 22 blood transfusions and it wasn’t until three hours later, at around 2am, that doctors managed to stabilise her. Mrs Cottam was taken to intensive care in a coma and placed on a life-support machine. Doctors told her husband, a technical manager, that she could be in a coma for days or even weeks. Fortunately, however, Mrs Cottam, of Flintshire, Wales, woke up around 12 hours later. She managed to hold the twins for the first time a day later and was well enough to go home the following week. The twins spent a fortnight in hospital and haven’t suffered any lasting effects. Dr Usha Rao, the consultant obstetrician who treated Mrs Cottam, said: ‘Amniotic fluid embolism is a unique, catastrophic condition.